Getting the concept ready for presentation. Have you ever looked at a leafless (possibly Not lifeless) tree and wondered if it’s truly dead ?Many trees have faced down a chainsaw wishing they could cry out “ I’m Not Dead Yet” like a scene from Monty Python’s Holy Grail - only to be removed before their prime. Be aware that some trees can appear as if to play Possum shortly after being planted. Watering : Water the tree with at least 1” of water a week after planting. Mulch: Make sure there is about 2” of natural mulch spread evenly around the base of the tree. Pruning: Don’t be afraid to consider taking off a few tree branches at the right time for the species of trees within the first few years. Check out Pruning Practices in Detail - below for more information. Proper Planting: Check below the ground . The tree may have been planted too low or high, it may be suffering from a lack of air to the roots or a lack of soil contact to the roots in the hole that was dug for it. In a worst case scenario where the tree was not planted properly, you might have to replant. Davey Tree has some in-depth helpful hints in “ Check the Planting of a Tree”. Landscape design doesn’t have to stop at the garden. The choice of lighting sconces and other details can bring the design together and complete a project. Don’t forget the details. Here's a Flat light sconce (2.5" clearance) that matches the pergola colour, fits between the wall and the column and accentuates the house brick texture and offers optimal ambience at night on the deck. By popular demand, We now provide realistic 3D renderings with all of our concept packages. Plans are ok but it’s far better to put yourself in the newly designed site to get the true look and feel of the Landscape to be. Coming Soon ... we are working on Virtual reality. A rendered 3D computer generated concept design. Make the lake join the pool without worrying about seaweed and cold water ... We are excited to share fresh images of one of our new designs come to life. Back yard pool entry and cabana. 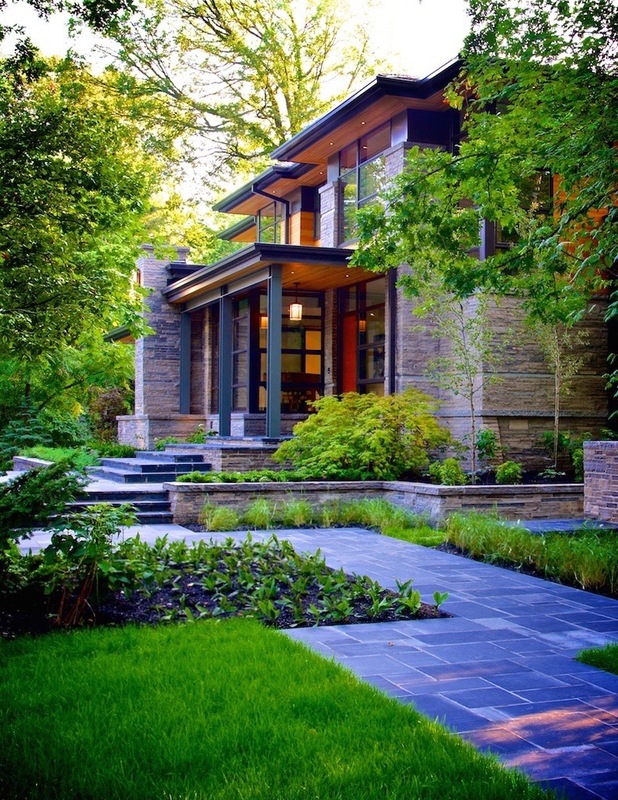 I love modern and contemporary Landscape designs. The intensity of craft and precision is the same as most other fine design. The trick is to maintain the geometry and enhance the precision and sometimes soften it rather than fight it. 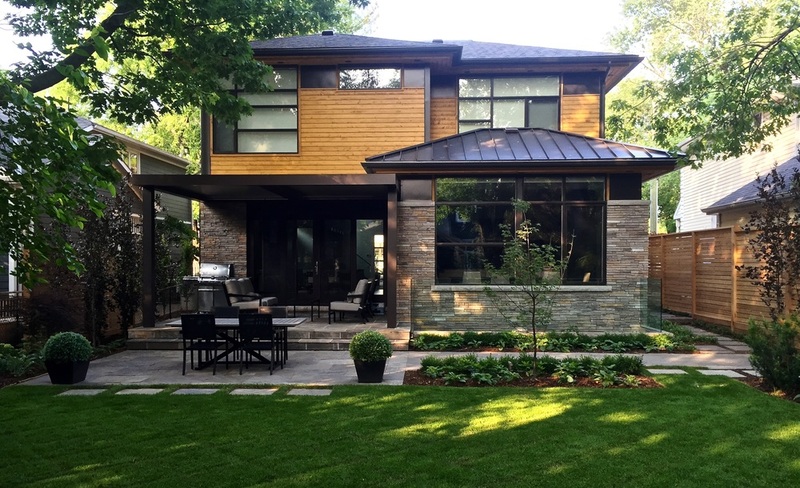 This project was completed recently in Oakville and has yet to show its full potential as it matures. 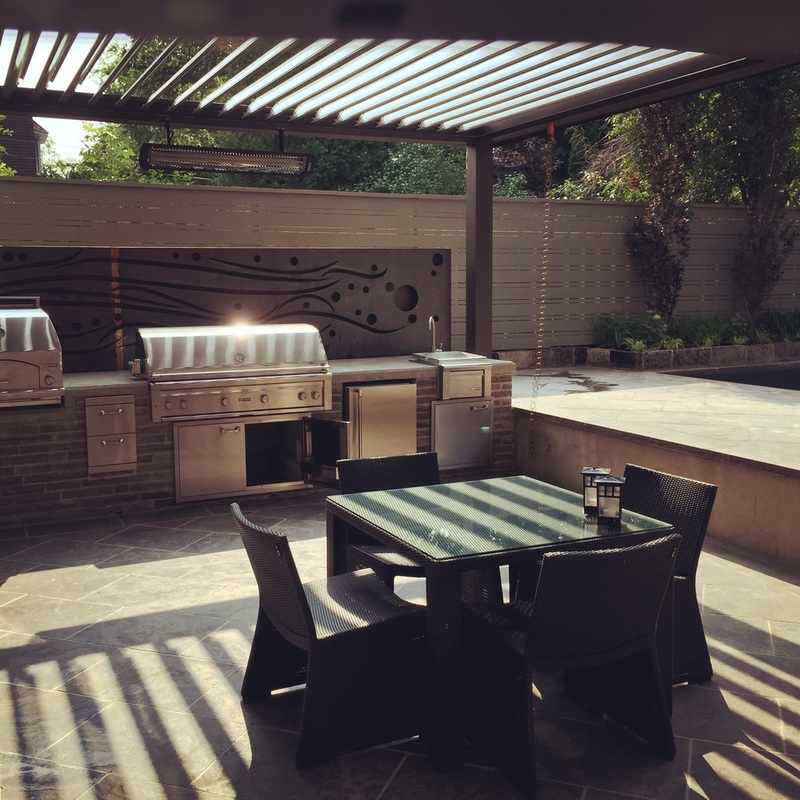 We took the liberty to add to the architectural features to enhance the use of outdoor space. Our address wall and back pergola bring structure and seasonal functionality. Project update- waterwall fire place coming along well. Water feature number 3 in place. Time to finish planting this beauty. 3 Season Rooms ensure Landscape enjoyment - all year long.